Today’s post is part of the “Death Perspectives” series; a series of guest posts written by those from different faith, or non-faith, persuasions, explaining how they’ve approached death, bereavement and grief. Today’s guest post is from Willem Dunham. This from Willem: I’m 55, owned and operated by a pit/lab mix and a batshit crazy rat terrier, both rescues. i believe the greatest gift and responsibility is to bear witness to one another’s lives. to that end, i am chasing down my dream; photography. i occasionally write, philosophize frequently, and wish i’d been braver sooner. I am an atheist. A man without religion or belief in any gods. I have two brothers and two sisters. Each of them has a belief in god or a higher power. Each of them worships their beliefs in some fashion. Both my parents, and their parents, believed in god, although I can’t recall more than a couple of times they went to church. Almost four years ago, my mom died. I’d spent the last 2-3 years of her life with her, looking after her. Difficult as it was at times, I wouldn’t trade that time for anything in the world. As much as our parents give us from the time we join this world, they’re trying to teach us to be good people. Toward the end of Mom’s life, she showed me who she was, and allowed me the opportunity to show her the kind of man I am. The hardest thing I will ever do was to watch her draw her last breath on this earth. People try to find the kindest ways they can to express their sympathies and to try to allay fears and soften pain for someone who is going through this loss. Quite honestly, they don’t help much. I don’t want to hear that Mom is in a better place. For my money, being dead and buried is not better than being alive and moving around. Because America is a predominantly Christian country, most people assume that I believe as they do. That is where hearing that she’s “with the angels now”, “god called her home”, “Jesus needed another angel” isn’t very helpful. I realize (intellectually) that these platitudes give comfort to people who believe, who hope for an afterlife, where you don’t really die, after all. For those of us who believe differently, or believe not at all, this isn’t comfort for us…it’s comfort for the speaker. The question comes around, then, to where does a nonbeliever find comfort and solace in these times? I can speak only for myself, when I say this: I have faith. Faith in the human spirit, in the resilience of the heart, in the ability of the mind to hold fast to dear memories of perished loved ones. I find little ways to keep Mom present in my life. Her father was a baker, and she naturally had a love of baked goods. While I enjoy cooking, baking has never really been of interest to me. Until, of course, she couldn’t keep regular food down and would ask and ask for a pie, a cake, some cookies. So, I learned to bake for her. And, in doing it for someone I treasured, I learned to love it. Now, each time I get in the kitchen to bake something, it’s as if she’s right there “helping” like she did. It’s silliness and joking. It’s time I got to have with her, where we were just hanging out and talking. Mom loved to drive. She’d told me stories of growing up, saving money so she could give it to her Mother for gas in the car, so they could “go for a drive”. As she got older, she had to give driving up, as she just didn’t feel she was safe on the road. Coming from two people who loved roadtrips and travel, I have the wanderlust as well. When she could no longer drive, I would take her for a ride. Some nights, it was the only way she could sleep…sitting in the passenger seat, looking out the window. In the last few years of her life, we took roadtrips to places she’d wanted to see. And we loved it. She’d make us sandwiches for the trip, we’d sing to the radio, talk, and ride in comfortable silence. I have some of her things, the ones that speak to the things she loved to do. I have her oil paints, brushes and canvases. I will learn to paint, to keep her brushes active. I have her sewing machine, and will learn to do a better job of sewing, so I can have an erstwhile hug in the things I learn to make. When I finally settle in someplace, I will grow roses, so I might find the peace in them that she did. I have an old sweater she wore all the time. I have it sealed up in a bag, so it will hold her smell. When I get truly lonely, I can take that out and have her with me. I have photographs of my mother from different ages in her life. Some are shy and awkward, as teenage girls can be. Some are stunning examples of the most beautiful woman I’ve ever loved. Others show her propensity for silly faces and antics. I am a photographer, and have my own captured moments that I can relive looking at them. None of these things takes away the pain, the feeling of loss. Time is taking the sharp edges off, but it still remains. I think it will be with me always. I do have small ways to remember, to keep her a part of my world, a part of my life. I still talk to her, ask her opinions, wish she were with me when I travel and see new things. Rather than rely on religious doctrine and a belief that she’s “up there” waiting for us to be reunited, I take the time to hug babies…they’re squishy and smell funny. Kind of like Mom. I remember. I tell stories, and remember the parts of herself as a person that she trusted with me, trusted to my memory and ideas of her as a person. In closing, I’d just like to say that, for the people who believe in heaven and the idea of being reunited with all their loved ones… I really hope that’s true for you. Per the Pew Research Center, the fastest growing religious segment in America are those who claim to be “unaffiliated”, which is comprised mostly of atheists and agnostics. As a Christian myself, I’m frequently disturbed by the false assumptions and harsh judgments that my fellow believers make towards atheists. 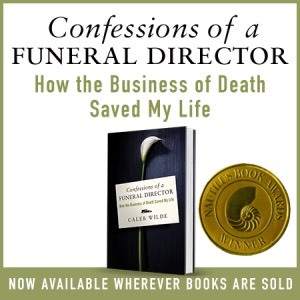 I’m especially thankful for Willem and his willingness to allow a glimpse into his life and how his beliefs have informed his grief process. It’s particularly valuable for those of us who are religious, as we too can learn something from Willem’s experiences. This entry was posted by Caleb Wilde on June 26, 2013 at 8:54 am, and is filed under Death of a Parent, Death Perspectives. Follow any responses to this post through RSS 2.0.You can leave a response or trackback from your own site.